PEOPLE from all over southern Queensland spotted a very large and bright meteorite at about 6pm last night and shortly after social media in Killarney on the Southern Downs lit up with residents reporting a "big bang". 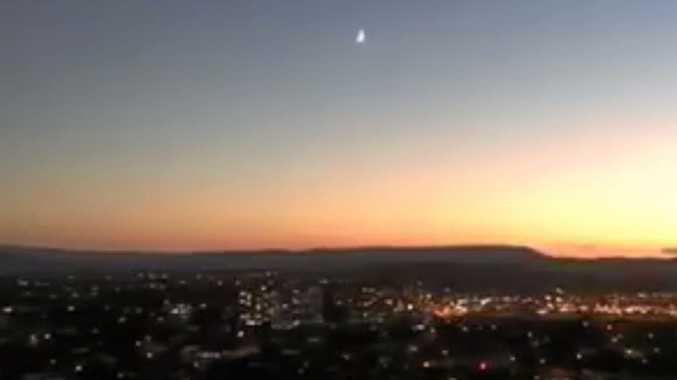 Footage taken from Runaway Bay on the Gold Coast clearly shows the bright object heading towards the Great Dividing Range before disappearing. But it was reports of a house-shaking thud in Killarney that really got social media buzzing. Brigitte Jones said, "I felt it out here,, the house shook." Madeline Wilkins posted "I'm in Toowoomba and saw a burning light in the sky maybe a meteorite, heading that direction just before I saw this post... Maybe related?" Killarney resident Krissy Bloomfield said, "On Brosnan Rd kids saw what we thought shooting star just before the bang." Some residents reported thinking the noise was thunder or fireworks. Louise Reed from the Queen Mary Falls Caravan Park posted, "We heard it up here too. It looked like a shooting star right before it and then bang." And this from Krystal N Lillee Cook, "We heard it in oak street...was really loud like a big crack of thunder."